Preheat the oven to 275F. Lay a sheet of parchment paper on a cookie sheet. Unwrap the candies and place three candies as close together as possible on the parchment paper. Make sure you offset each group to leave room for the lollipop sticks. Place them in the oven for 5 to 7 minutes until the candies are fully melted. Keep an eye on them after the 5 minute mark to make sure they don't completely melt into a liquid. 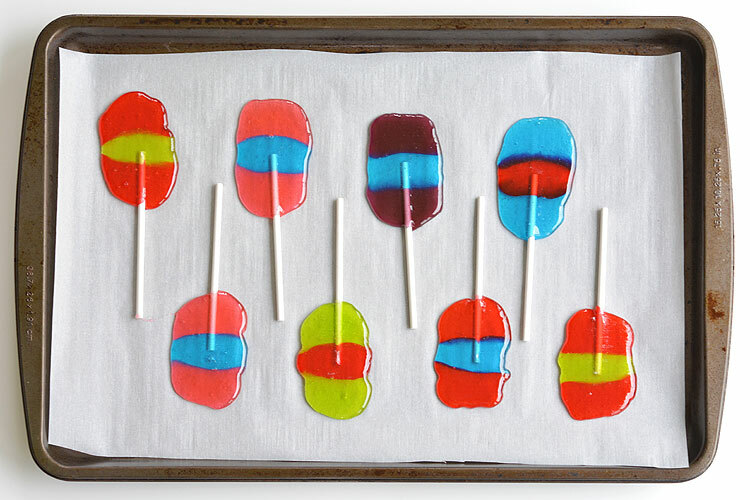 Remove the cookie sheet from the oven and immediately push the lollipop sticks into the melted candy. Roll the sticks slightly to completely cover them with candy. If the sticks aren't quite covered, return the cookie sheet to the oven for 1 minute and adjust the lollipop sticks as necessary. Let them cool at room temperature for about 25 minutes.